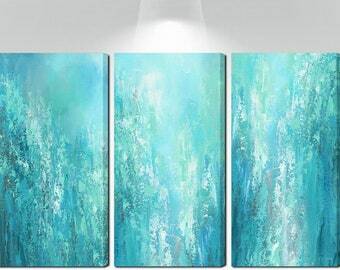 There's a wide variety of triptych sizes to choose from that will cover an area up to 72” wide (plus space in between panels). Small sets are suitable for hanging over a side table or chair. If you're looking for master bedroom wall art, the 60" wide set usually balances the best over a king bed and I recommend the 54" set for a queen. The larger oversized print sets work well over a long dining room table, living room sofa or sectional, or hanging in an office lobby or conference room. If finding unique art matters to you, you're in the right place. ArtFromDenise is offered exclusively on Etsy and not mass produced or sold in department stores. When it comes to quality, no shortcuts are taken either in materials or in the love and craftsmanship put into each and every fine art print. Canvas prints are made in the U.S.A. from start to finish and ready to ship in 2-5 business days. 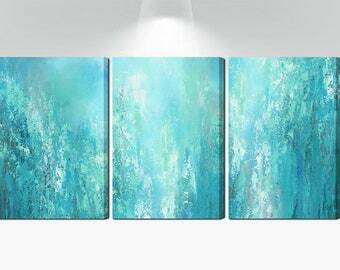 ☼ Medium: High quality giclée canvas prints of original paintings by Denise Cunniff. ☼ Finish: 1.5" deep gallery wrapped edges will be printed to match the front (mirror wrap) and satin varnish will be added to seal the artwork and protect your investment. 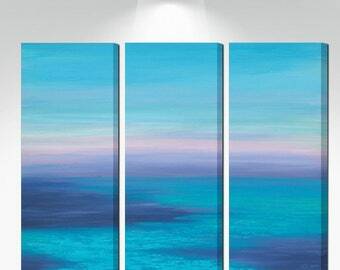 No need for frames - just hang the art and enjoy. Hanging hardware will already be installed for you. ☼ Your choice of canvas sizes (width x height for each canvas): Mini 8x16", 10x20", 12x24", 15x30", 16x32", 18x36", 20x40", 22x44", or 24x48"
ArtFromDenise prints are custom made to order after your order is placed. No prints are kept in stock. So, if you're not sure which size is best for your space, you might want to tape together some paper to create a mockup of the size you're considering, and then tape that paper onto the wall. This will give you a good visual of how that size will balance with other furnishings. If needed, add more paper until you determine the best fit. Let me know if you need a size that isn't listed and I'll be glad to create a customize your order. NOTE: Colors on computer monitors can vary, so if you're trying to match specific colors, I highly recommend purchasing a color proof. 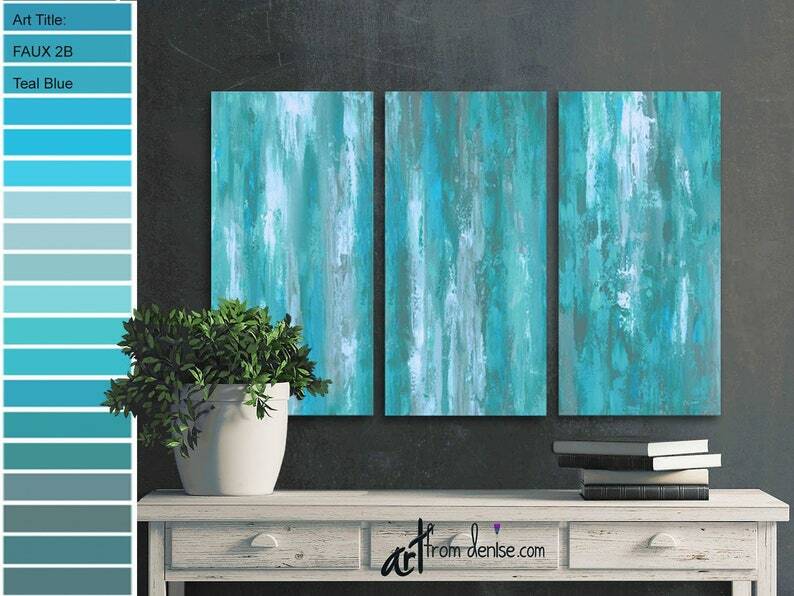 ► READY to order this ArtFromDenise? FOR PRICING, click on the drop down menu above the ‘add to cart’ button to make your selection. PROCESS: With ArtFromDenise, no shortcuts are taken, either in materials or in the love and craftsmanship put into each and every art print. With the help of my expert production partner, your design will be printed with digital files of my original painting using giclée printing technology and fade-resistant archival inks, which guarantees vivid colors that will last for over 100 years. The high quality canvas is made of thick archival grade poly-cotton blend to provide greater durability, pH neutral, acid free, and will not yellow over time. After printing, your canvas is carefully hand stretched and stapled over kiln dried solid pine stretcher bars, ensuring that the canvas print does not warp or bow. The canvas image is tightly wrapped around the frame with the corners cut and carefully folded to produce neat corners and back-sides in gallery wrap style, which means artwork covers the side edges of the canvas. After assembly, your canvas print will be varnished by my production partner, who will package your art in a sturdy custom made box and ship it to you. One final note on the quality: Just so you’re aware, outlets that offer cheap prices on canvas prints usually use cheap canvas, cheap knock-off inks, engineered or very thin wood, do not take the extra care during the canvas stretching process, and cut corners with print quality. Super cheap prices are an indication that the art is mass produced in China, Mexico, etc. With these outlets, their goal is to sell as many prints as possible, and they really don’t care how the prints hold up over time. With ArtFromDenise, quality and customer satisfaction are the top priorities. Because I do care. ► DON'T LET IT SLIP AWAY! ☼ Want to save this item for later? Click on the heart that says "Add Item to Favorites." ☼ Have a question? Send me a message by clicking the small “ask a question” button. ► WANT TO SAVE THIS LINK to ArtFromDenise? Click on the "Add to Favorites" heart on the left column of my home page. You might also want to keep this shop in mind for personalized hostess, anniversary and wedding gifts. Because ArtFromDenise offers only custom made to order items, all sales are final. As mentioned above, color proofs are available. And an easy way to determine the right size is also provided above. But please contact me if you have any problems with your order. NOTE: ArtFromDenise does not keep prints in stock. Each print is made AFTER you place an order. This ensures you receive a brand new item, eliminates inventory costs, and ultimately allows this small art business to remain sustainable. Of course quality is always guaranteed, and if an item is damaged during shipment a replacement will be sent. Please submit photos showing proof of damage within 48 hours of delivery. Rest assured, ArtFromDenise only offers high quality products. NOTE: LISTINGS DO NOT INCLUDE SHIPPING COSTS TO ALASKA, HAWAII, OR OUTLYING AREAS OF THE U.S.. If you live outside the 48 Contiguous US States, please contact me prior to purchasing. Please provide your shipping address plus the print size you need and I will be glad to get the shipping rates for you. If you purchase without contacting me first, I may have no choice but to cancel the order (due to the high shipping rates for any large package that doesn't travel via the post office). Also, please be aware that this shop no longer accepts PayPal payments for international orders, and all international sales are final. ► COPYRIGHT NOTICE: This image has been filed and is protected under copyright laws and may not be reproduced or copied in any way. By purchasing this listing, you will own this one piece of art, but not the rights to reproduce it. By law, Denise Cunniff retains all rights to reproduction of this artwork. Any attempt to copy, reproduce or create derivative works from any of Denise Cunniff’s works of art displayed online will be legally prosecuted as stated by law. This is how I protect my business. Feel free to pin this listing to your pinterest boards! All I ask is that you credit me by including “art by Denise Cunniff At ArtFromDenise” in the copy description. I love pinterest and have tons of boards! ► THANKS for your interest in ArtFromDenise and HAVE FUN SHOPPING! Piece is beautiful. Seller great to deal with. I do think it’s a bit pricey but I do love it. Just moved into a house that had an actual laundry room instead of being in a garage or hallway. Have had fun decorating it, but this piece of art was the final finishing touch and crowning glory that brought it all together. The vibrant colors really pop .....my theme came together, and it is the focal point instead of the washer/dryer. It was more than I would have thought I'd spend on something for the laundry room....but when I saw it, I had to have it......and no regrets! Your art is beautiful, Denise.....and it was packaged with such care. Thank you. ☼ IF YOU LIVE IN THE U.S. you can pay with a credit card through etsy’s direct checkout. ☼ If you’re using a third party app to pay with (i.e. ApplePay) please double check the ship to address/information when you’re submitting the order. Some third party apps can override ship-to addresses on Etsy accounts. Etsy sellers cannot be held responsible for any issues with third party apps, and no refunds will be issued by Etsy or ArtFromDenise. ☼ Orders will be sent to the shipping address that you select from your etsy account. ☼ Rush orders and shipping upgrades are not available for quicker delivery when ordering ArtFromDenise. All items are made by hand, which takes time. And in my experience, unless it's overnight air, shipping upgrades rarely get a package delivered quick enough to make the cost worth it. Patience is not simply the ability to wait - it's knowing that what we're waiting for is absolutely worth it! Due to the many size options I offer for each print listing and associated limitations on the Etsy platform, my listings aren't set up for calculated shipping. I do my best to keep the price on all items AS LOW AS POSSIBLE because that's what most customers want. For this reason, I've set a flat rate for standard shipping and handling. This is based on my average orders and the excellent volume discount that my production partner gets. I pass those savings onto you. However, when ordering an oversized canvas print or print set, that rate rarely covers the actual amount paid to the carrier on your behalf. But, it's as close to "free shipping" as I'll ever offer. Carriers don't ship anything for free, so that means it's up to you or me to cover the costs. Which every shopper does when they think they're getting free shipping. Those costs are just hidden in the product price. I believe in transparency. ☼ For ship-to addresses in ALASKA, HAWAII, OR OUTLYING AREAS OF THE U.S. - Listings may not cover a fair amount of the shipping costs because Fedex and UPS base the costs to ship to those locations on international rates. So, unless you're ordering a print on fine art paper, a very small ready to hang canvas print, or an unstretched canvas - which can all ship through USPS - there will be additional shipping charges. So please contact me prior to purchasing and provide your address and the print size you prefer. I'll be glad to look up the postal rates and set up a custom listing for you to purchase. If you live in one of these areas and you purchase without contacting me first, I may have no choice but to cancel the order. Listings do not include the option for unstretched canvas, so please contact me if that's an option you want to consider. ☼ I no longer accept INTERNATIONAL orders. No exceptions. Before ordering, it's a buyer's responsibility to read and understand item descriptions and processing times, enter the correct ship-to address, and review store policies that are unique to each Etsy shop. And it's great that you're allowing the time to read about my shop policies. An informed shopper is a responsible shopper. And a happier customer! Which is why I do this. It's all about sharing that happy and feel-good factor. With art that you love in the colors that you favor. For both of my shops, in the detailed description for each listing I do my best to provide essential information and include accurate digital images that are as close as possible to the product a customer would receive. Please don't hesitate to contact me before placing an order if you have any questions. 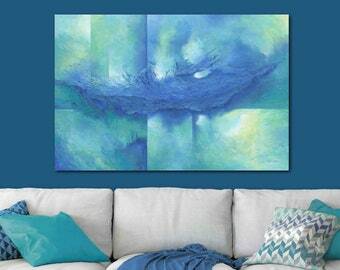 The ArtFromDenise wall art and home decor line is not mass produced or sold in department stores. No printed products are kept in stock. Each high quality item is made exclusively for each customer and offered direct from the artist. That's me. A one woman art show. The only way I can offer this small independent line of art decor is by maintaining standards and policies that are appropriate for my small business structure and allow for continued sustainability. This includes choosing not to maintain a product inventory. I do not stock or resale items like big box stores do. Every ArtFromDenise print is made to order after each order is placed. The art will be created just for you in the size that you choose to fit within your own space. You're guaranteed high quality brand new art that has never been touched by the retail public and was created in a professional smoke/pet-free space by expert craftsmen. It truly is made just for you. The production process begins soon after each order is placed. Each canvas is printed with a high quality professionally scanned image of my original painting using fade-resistant archival inks. 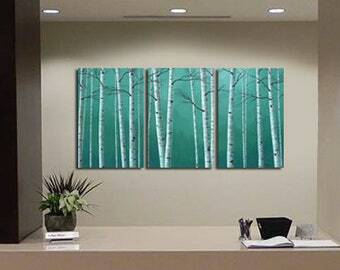 The canvas is then varnished, dried, assembled, packaged and shipped within 3-5 business days. Due to my production partner's policies, this process can't be reversed. If you're not sure which size is best for your space, I recommend that you tape some paper together to create a mockup of the size you're considering, then tape that paper to the wall where you plan to hang the art. This is the BEST way to get a good visual of how that size will balance with surrounding furnishings. If needed, add more paper until you determine the best fit. Let me know if you need a size that isn't listed and I'll be glad to customize your order. If you've tried the mockup and you're still unsure about the size you should order, please ask me for help! With 35+ years of experience as a professional artist and designer, I'm always happy to assist you in making the perfect selection. Free of charge. Colors on monitors and screens can slightly vary, so if you're trying to match specific colors in your decor, I recommend starting with a color proof. An ArtFromDenise proof is a small mini version of the entire art piece printed on loose canvas fabric. Also printed on that same canvas are small color chips of colors that I've selected from the artwork. 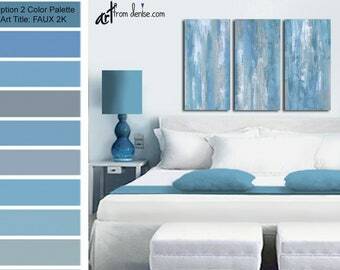 It's a great way to compare those colors to the decor in your space. It's also very handy to carry with you when you're trying to find matching accessories locally. Every item is carefully inspected by the production company's quality control department before being shipped to you. But, they are busy humans and mistakes can happen. Rarely. They really are the best! But upon arrival of your new art print, if you discover that there's a any kind of defect, please contact ArtFromDenise within 48 hours and attach photos that clearly show the defect. A new replacement item will be created and shipped to you free of charge. Returns, exchanges and cancellations will not be accepted and refunds will not be offered. 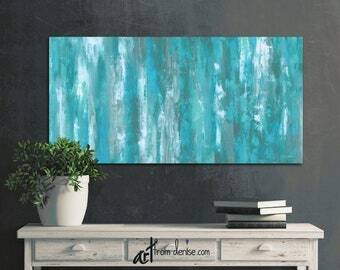 This includes instances where a buyer purchased from ArtFromDenise and changed their mind, ordered the wrong size, the wrong design or art piece, or didn't read the item description or shop policies. Please purchase responsibly. And please keep this in mind... In no way am I trying to compete with big retailers that can easily absorb the costs associated with returns or refunds. We may offer items in the same category, but they have huge inventories and thousands of customers generating millions in revenue. I don't. Producing one brand new high quality art print that is made to order exclusively for one customer is totally different than mass producing thousands of cheap pictures to warehouse and sell to the masses. It's like comparing a delicious homemade chocolate cake to a dog treat made in China. You can buy those cheap dog treats anywhere, but it takes time as well as the right recipe and ingredients to create a fresh new fabulous chocolate cake. Or beautiful high quality art offered direct from the artist at her best possible price. 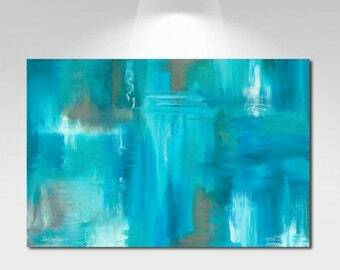 Whether it's canvas wall art, a wall tapestry, throw pillow, shower curtain, or bedding, quality is always guaranteed and there are hundreds of design selections and options to choose from throughout my ArtFromDenise Etsy shops. Links to all options for each design in each art collection are included in each of those listings. The links are easily found under "More Options" as you scroll down the page. If you have any questions, just send me a convo. Your support of handmade in the USA is truly appreciated! ♥ Have fun shopping! And decorating! All ArtFromDenise prints are custom made to order AFTER an order is placed. Each print requires 3-5 business days to create (plus shipping time). During holiday seasons, orders can require up to five additional business days to create and longer than usual to ship. Remember, your item is made to order, so please be patient. The creation process starts as soon as a customer's payment has fully processed, or when a replacement order has been arranged. Packages are shipped Monday through Friday. There is no shipping on weekends and holidays. During holidays, orders can require up to five additional business days to create and longer than usual to ship. Orders arrive packaged in custom cardboard boxes that are made by hand to securely fit around the art. Nothing fancy. I would love to get creative and make the packaging more fun, include a handwritten note, and offer gift wrap for each item. However, my production partner focuses on creating quality product and delivering it safely and securely, and he simply isn't set up to handle any extra services. But, it's the thought that counts, right? Not to mention that awesome new art that's IN the package. Enjoy that! ArtFromDenise prints are shipped by USPS/Priority Mail or FedEx within 3-5 business days. For all print orders, I offer standard shipping with tracking. 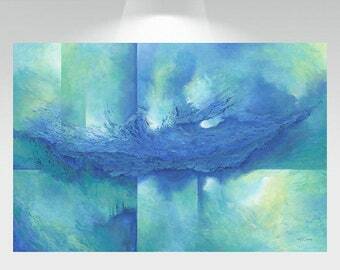 If you're purchasing an in stock original painting from ArtFromDenise, they're shipped by FedEx. Your painting will be fully insured for the purchase price, with delivery confirmation and a signature required. It's the customer's responsibility to enter and choose the correct ship-to address BEFORE purchasing. That's where your order will be sent to. PLEASE make sure your account information in your profile settings are updated with the correct address and information BEFORE you make any purchase. If the item is a gift that needs to go to an address other than your own, you will need to add that to your list of addresses on your account and make sure to select the right one when you’re checking out. When you pay a shop to ship a package to you, after our creation process is complete we will be handing over that package to the carrier on your behalf. 98% of the time carriers do a great job delivering orders quickly and safely. But ultimately, it's not up to Etsy sellers how a carrier handles a package nor are we required to cover any costs associated with delivery problems that are out of our control. We're also not required to replace the order when it's delayed. Big businesses can easily absorb those costs and offer that as a service if they choose to, but ArtFromDenise is not a big business. Comparing Etsy sellers to big retailers is like comparing apples to oranges. We may offer items in the same category, but we don't have the same type of business structure. At all. In the rare event damage occurs in transit, please contact ArtFromDenise within 48 hours and attach photos that clearly show the damaged package AND the damaged product. In most cases, a replacement order will be sent to you right away. Carriers usually need to see the damage before a claim can be processed, so please hold on to the product and all original packaging material until I inform you otherwise. If the BUYER starts a claim process with the carrier, they will not receive a replacement canvas from ArtFromDenise (or refund). Getting a refund from the carrier AND expecting a replacement canvas (or refund from me) essentially means they would get it for free (or double their refund). It's also fraud and a very popular online scam. If the BUYER damages the box and canvas intentionally, don't expect the carrier to accept a claim, or any refunds from me. This is another popular online scam. One of those scammers hit ArtFromDenise in Jan, 2019. And I learned my lesson. I've had a no refund policy for a long time because all of my prints are made to order exclusively for one customer. But this fiasco coupled with shipping carrier delays this past Christmas season prompted me to revise store policies for both of my shops. As a tiny one-person business, I simply can't afford losses due to scammers, or the costs associated with covering issues caused by shipping carriers, which I have no control over. Unless you've been promised otherwise by a registered shop owner, Etsy sellers are not held responsible for issues caused by shipping carriers and no refunds or free replacement orders will be issued by Etsy or ArtFromDenise due to delays or a carrier's inadequacies. This includes"insufficient address", "return to sender", “failure to deliver”,"unclaimed package", delayed packages, or lost packages. We are also not responsible for packages that are stolen off of a porch. Buyers are responsible for entering the correct shipping address on their Etsy account and verifying that ship-to address during the check out process. If a buyer provides an old address, incomplete address, or wrong address, the package will be deemed "insufficient address" or "undeliverable as addressed" and in most cases, returned to sender. If it is returned and the buyer wants the package re-shipped to the correct address, they must submit payment for all shipping costs within 48 hours (as outlined above). No refunds or free replacement orders will be issued for orders due to an "insufficient address" or "undeliverable as addressed". It's a buyer's responsibility to enter and select the correct ship-to address. If a package is returned to sender, I'll be glad to resend the order back to the recipient. However, the buyer will first need to pay for all additional shipping costs. Carriers don't ship anything for free. Even when it's a 'return to sender', I'm charged for that additional shipping cost from Fedex or UPS. So, the buyer will be responsible for any "return to sender" shipping cost as well as the cost to re-ship the product to them. If the buyer chooses to have the item re-shipped, I'll set up a new listing that covers all related shipping costs and provide them with the link to that listing. If payment is not received within 48 hours, my production partner will discard or donate the item. They aren't set up to hold and keep track of returned packages indefinitely and there's no reason for me to pay them for shipping it to my studio. ArtFromDenise does not RE-SALE items that other buyers have handled. My customers are guaranteed brand new art that is created exclusively for them. A tracking number is provided when the order is shipped and it’s up to the buyer to make arrangements to receive the delivery. It's also the buyer's responsibility to make arrangements for re-delivery of the package. Large companies can afford to hire staff to help handle all of that if they choose to, but it's much quicker and more efficient for the intended recipient of a package to take care of that locally. If the package is returned to sender and the buyer wants the item re-shipped, they must submit payment for all shipping costs within 48 hours (as outlined above). No refunds or free replacement orders will be issued for packages that the carrier was unable to deliver. If a buyer refused a package, failed to claim a package at the Post Office, or failed to reschedule a delivery, the package is considered "unclaimed" and it's the buyer's responsibility to contact the carrier and either pick up the package or make arrangements for re-delivery. If the buyer fails to do that in a reasonable amount of time, the package may or may not be returned to sender. Which I have no control over. If the package is returned to sender and the buyer wants the item re-shipped, they must submit payment for all shipping costs within 48 hours (as outlined above). No refunds or free replacement orders will be issued for lost or "unclaimed" packages. I've always done all that I can do to assist in tracking down a package that appears to be delayed or lost, and will continue to do so. Not long ago I was still offering the service of replacing orders that were delayed longer than usual and appeared to be lost. But, that all changed after the last Christmas shopping season. In every instance of a delayed order, that original order showed up. As well as the replacement order. In every instance of a package assumed to be lost, that original order showed up. As well as the replacement order. In ever instance, I had to cover the extra costs for product and shipping for every replacement order. In too many instances when a replacement order was sent before that original order showed up, buyers refused to return the extra order. And there's nothing I can do about that. For that last Christmas shopping season, shipping issues cost my decor shop almost half a month's profit. And hit this shop as well. When you're selling quite a few big ticket items like I do, that has the potential to put a small business out of business. Solely due to the inadequecies of carriers, which I have no control over. For these reasons, free replacement orders will not be issued for delayed delivery of packages and no refunds will be offered. Patience is the best solution. Which is not simply the ability to wait - it's knowing that what we're waiting for is absolutely worth it! Discounts are available to certified interior designers. To take advantage of that benefit, designers must contact me before placing an order and include their professional accreditation along with a copy of their business license and taxpayer I.D. Thanks to the decades of working in the interior decorating and design industry, creating custom paintings to coordinate with interiors is one of my specialties. And isn't it great when you get to say “This was painted just for me!”. If you're considering a custom painting, please contact me and provide as many details about what you have in mind (i.e. preferred colors, style, image, size, etc.). Sharing images found online that are similar to what you have in mind can be a tremendous help. It helps me 'get in your head' and visualize what you might want. Please be aware that I will not 'copy' anyone else's artwork, but it can be used for inspiration. And please include photos of the room where the artwork will hang. 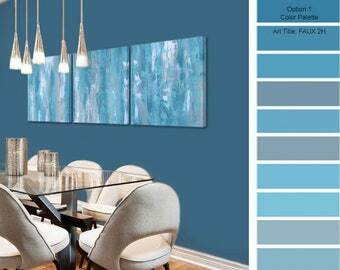 A custom painting is the perfect opportunity to get exactly what you want AND complete your color scheme. In any room, there should be a happy harmony where the colors play off of each other and create a sense of balance. If you need to match any specific color(s), please let me know and I'll be glad to custom mix the colors to coordinate with your decor. I'll need you to pick out color chips at your local hardware store and send them to me. By snail mail. I do not attempt to match colors on a computer screen. That would not only be difficult and strain my eyes, I would be painting my MacBook in the process. I mix and mix and keep dabbing it on the color chip until it's as close as possible. For instance, if you want the painting to match the colors in a pillow, you can take that pillow to your paint supply store (Lowe's, Home Depot, etc.) and find color chips that are a close match in a variety of shades. If possible, please include a sample of your wall color. If you have leftover wall paint, you can simply paint this on a sheet of white paper. If you have fabric samples that you need to coordinate with, you can mail those to me as well. After your order is processed I will provide you with my mailing address. The sooner I get your color samples, the sooner you get your painting. On a first come first serve basis. If other custom paintings are ahead of yours, I will finish those first. Staying in the flow of one creation at a time. If you're considering ordering one of the in stock original paintings that I offer, please keep in mind that colors on computer monitors vary, so what you see on your screen may be slightly different than the actual painting is. If you need an exact color match, the best option is a custom painting. Every canvas I use is high quality archival grade 100% cotton and gallery wrapped - where the canvas is stretched tightly around the edges and stapled on the back. The canvas edges will be painted in black (or another color if you request it), or the sides can be painted to match the art on the front for an additional charge. There’s no need to frame the painting, unless you just want to. I don't offer any framing services because there's just not enough time in a day to do it all. I've painted on tiny surfaces all the way up to huge murals on buildings - in a variety of styles and themes - so anything is possible. Just keep in mind that I can’t stock canvases in every conceivable size. A custom made canvas is always an option, but it will add to the the total price of the painting, the shipping costs, as well as the turnaround time. 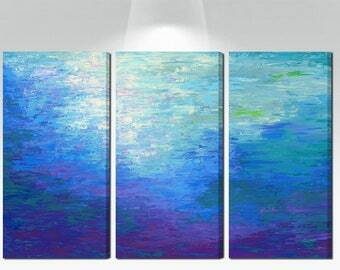 A custom sized canvas usually takes about a week to have made. If you're not sure which size canvas is best for the space, tape together some paper to create a mock-up of the size you're considering, and then tape the paper onto the wall. This is the BEST way to get a good visual feel of how that size will balance with surrounding furnishings. If needed, add more paper until you determine the best fit. Horizontal: 12x24, 12x36, 18x36, 24x48. 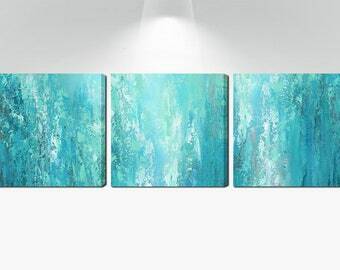 - Other groupings where the same size canvases (or a variety of sizes) can be grouped together to have a greater impact. All paints, mediums and varnishes used are archival quality professional grade acrylics. I also create paintings occasionally using watercolors, watercolor pencils, or pastel chalks. I'm not an expert with watercolors so I wouldn't feel comfortable offering a custom painting in that medium, but the I love the watercolor pencils when an illustration look is required, and have been head over heels in love with pastel chalks for a long long time. They are pure pigment and can produce some of the most vivid colors you will ever see. In fact, I need to get them out and create something new with these jewels for this shop! .... there just isn't enough of that precious thing called time to create what floats around in my brain and heart. And they are very messy! Because they're pure pigment which includes heavy metals, they're also not very safe to dabble in on a regular basis. Specialty framing is required. Prices for custom paintings vary depending on style, size and subject. The minimum price for one of my custom paintings is $300, even if it's only a 10x10". There's a great deal of time that goes into working with a client and creating their custom painting, regardless of size. 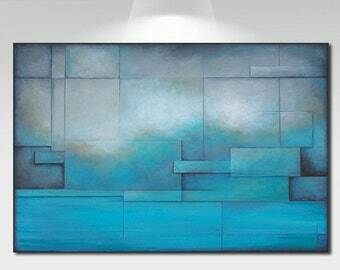 If you're wanting an oversized canvas, in some cases the best option may be an unstretched canvas. The finished painting would be rolled and shipped to you in a tube. After you receive the artwork, a professional framer can stretch and mount it locally. The canvas will include enough width and length to wrap around the back edges of the wood support frame. When we've agreed to all the details and you're ready to purchase a custom painting, I'll create a custom listing for you to purchase. You'll have 48 hours to submit full payment. After the order is processed, I'll let you know when I plan to start your painting. All custom paintings are created in the order they’re received - one at a time - until that customer is happy with the results. It's what artists call "staying in the zone"
From that point, in most cases it will only take about a week to complete the painting process, but the turnaround time will be at least 3-4 weeks, plus shipping time. This all depends on humidity, since the paint needs to cure for at least seven days before it can be varnished, and the varnish needs to cure before the canvas can be packaged for shipment. Even though many artists don’t take these steps to allow paint and varnish to cure properly, I've been doing this for a long time and know that these steps are necessary to protect your investment. A proof of the final art image will be emailed to you for approval before the painting is varnished and shipped. If you have any questions about the process, please don't hesitate to ask.